Twenty years before the commencement of the “Space Race” there was the “Grand Prix Motor Race” in which Hitler and Mussolini would use Grand Prix racing as the stage to parade their rapidly increasing technological prowess. The 1937 season had ended with the last (non-championship) race at Donington Park on October 2. It was a glorious sunny afternoon and 50,000 spectators had turned up to watch the show. Race organiser, Fred Craner, had managed to entice the Germans to attend and it was the first bona fide international race ever held in England. 4 Mercedes-Benz cars lined up against 3 Auto Unions on the 15 car grid. The quickest British car was Raymond Mays, 16 seconds slower than the pole setting Mercedes of Manfred von Brauchitsch, but the best of the 5 ERA Voiturettes (light-weight racing cars with engine size limited to 1.5 L). 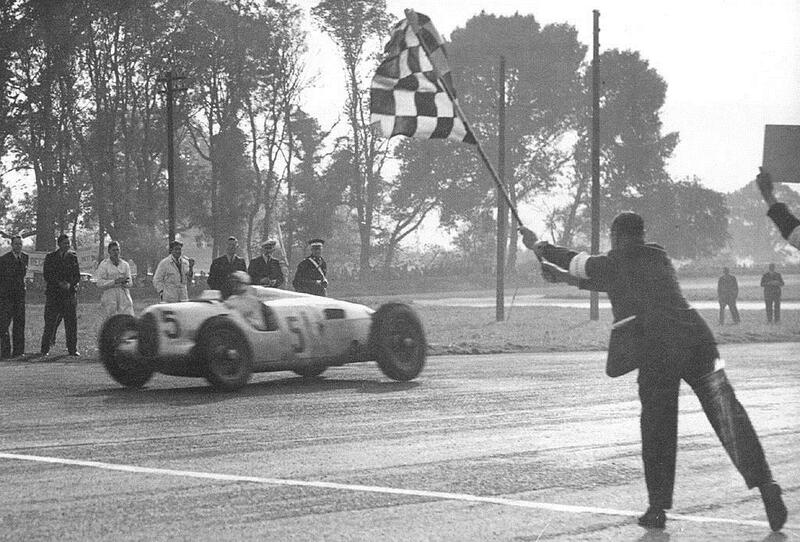 The race was won by Bernd Rosemeyer in his formidable 520 bh 6 L V-16 Auto Union and the first non-German car home was B Bira, piloting his Maserati to sixth place, 2 laps down on all the Germans. The sport had effectively been taken over by the German motor industry. They were competing against each other with no regard as to cost as they were being bankrolled by what was increasingly being seen as a repressive regime. The German cars were now preparing to steam-roll the 1938 season with the new formula for Grand Prix cars, which had been intended to give small cars a chance to compete on equal terms with the larger cars. The smaller your engine capacity, the lighter your car could be, from a 4.5 litre un-supercharged (3 litre supercharged) car that had to be a minimum of 849 kg all the way down to a 1 litre un-supercharged (666 cc supercharged) car weighing 400 kg. In the end everyone went for maximum engine capacity and maximum weight anyway! 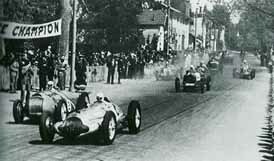 Mercedes Benz had finished 1937 at the top of the table with Rudolf Caracciola winning 3 of the 5 championship rounds. For the 1938 season they had tested both a 4.5 litre un-supercharged as well as a 3 litre supercharged engine and had decided on a 3 litre supercharged V-12. They modified their W125 chassis to make the W154 and ingeniously mounted their engine at an angle and had their driver sit along the propeller shaft which resulted in a ground-hugging chassis. Their lead driver was Rudolf Caracciola and British driver Richard Seaman was their junior driver. Auto Union were starting the 1938 season in disarray. They had either fired driver Hans Stuck, or he had quit, depending on whose side you were listening to! Their chief designer Porsche had taken his phenomenal design capabilities to VW and Bernd Rosemeyer, their World Champion driver from 1936, had tragically died in January attempting a land speed record attempt in a competition with Rudolf Caracciola. Eberan von Eberhorst had stepped up to the plate and had constructed a 3 litre supercharged V-12. He had also tested their non-traditional chassis design, which included horizontal tail fins, in the wind tunnel of the German Institute for Aerodynamics – the first designer to introduce modern aerodynamic thinking into racing cars. To give an idea of how radical a departure this was at the time, his ideas would later influence Ferrari engineer and designer Mauro Forghieri in the 1960’s and 70’s. On the first of January, 1938 Sudaria Ferrari was dissolved and emerged as the Alfa Corse team. Enzo Ferrari remained in residence as team manager and Tazio Nuvolari was their lead driver. Attempting to hedge their bets they constructed three different 3 litre engines: a straight 8, a V-12 and a V-16 but, unfortunately, in doing so they spread themselves too thin as their development suffered and none of them were competitive. They ended up using their 3 litre straight 8 but their only win for the season would be the non-championship round in Rio de Janeiro that no European drivers attended. Maserati had struggled during the depression and in 1937 the Maserati brothers sold their shares to the wealthy industrialist Adolof Orsi, and the factory moved to Modena. The brothers continued to work in engineering roles within the company. 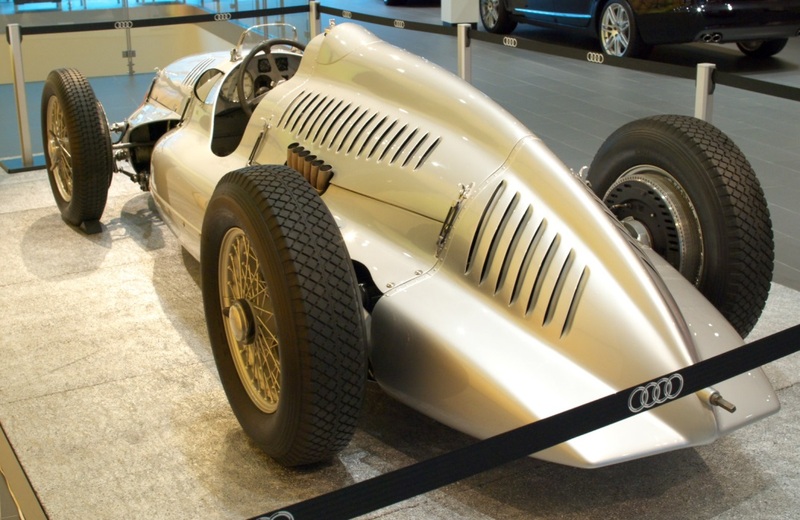 They built a 3 litre straight 8 engine and although the car was extremely fast and was able to challenge the Germans for speed, it was also incredibly fragile and struggled to compete against the reliability of the Mercedes and Auto Union. French teams Delahaye and Talbot both used regularly aspirated 4.5 litre engines for the 1938 season. Delahaye had developed a new 4.5 litre V-12 with a new chassis. Even though Talbot were given 600,000 francs from the Fonds de Course committee (a government body that used public money to try to achieve success in motor racing) to develop a 3 litre V-16 engine, it was never seen and they raced in 1938 with an enlarged 4.5 litre variant of their 4 litre sports car engine. There is a rumour the money was siphoned off to build a factory to fabricate Pratt and Whitney aircraft engines! Bugatti also received money from the Fonds de Course for further development (in their case 400,000 francs) and they constructed a supercharged 3 litre straight 8 engine that they put into their outmoded chassis. During the winter of 1937 ERA began working on a Grand Prix car, however, it soon became clear that the car would not be able to compete with the pace of the German cars so only one car was eventually produced – the R4D. White Mouse Stable bought a 1937 ERA-C for B Bira to race in the 1938 season. It was during 1938 that German expansion escalated. Hitler had always considered Austria as being a part of Germany (he himself was born in Austria) but the Treaty of Versailles at the end of World War 1 had expressly prohibited the unification of Germany and Austria. Austrian Chancellor Kurt von Schuschnigg met with Hitler and was bullied into naming several top Austrian Nazi’s to his cabinet. Schuschnigg eventually resigned, along with most of his cabinet, on March 11 after Hitler threated that he would devastate Vienna and turn it into the Spain of Austria (referring to the devastation of Guernica in Spain caused by the bombers of the Luftwaffe). The following day German troops marched into Austria and were greeted by an enthusiastic crowd waving flowers and Nazi flags. The rest of Europe chose to look the other way. As a shakedown to the championship races of the season, Mercedes-Benz entered two of their new cars in the Pau Grand Prix. Auto Union made the decision not to attend. 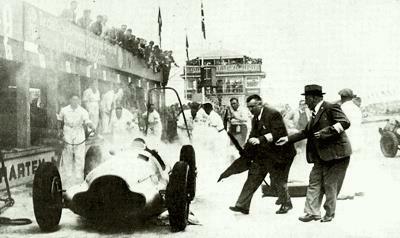 Nuvolari’s new Alfa Romeo caught fire during practice due to chassis flex rupturing the saddle fuel tank! He was furious and declared that he would never race for Alfa Romeo again. He announced his retirement from racing and immediately departed for a holiday in America. As a precaution the other two Alfa Romeo cars were also pulled out of the race. Due to the twisty nature of the French street track the non-supercharged Delahaye were able to keep up with the Mercedes Benz’s. The Mercedes was also required to pit for fuel and then later in the race developed plug trouble. Dreyfus in his Delahaye was able to dominate the last part of the race to win by almost two minutes. Auto Union showed up at the Nurburgring with 4 cars. 2 of which had their new aerodynamic coachwork, but the sensation of the race was that Nuvolari had signed on as their lead driver! He was the fastest Auto Union driver during practice but was fifth on the grid behind the 4 Mercedes’. Mercedes had bought 7 cars with them; 4 race cars and 3 spares. This gave British driver Richard Seaman his first race for the year and he put his car on the front row of the grid. The first Alfa Romeo’s were back on the fourth row over 40 seconds slower. Fred Craner, race organiser of the Donington Grand Prix, was relieved when Auto Union and Mercedes turned up at Donington for practice on September 25, the Sunday before the Grand Prix. There had been increasing tensions in Europe and it was becoming clear to everyone that war was looming. However, 2 days later, the teams received an urgent telegram from the German Embassy advising them to head homeward because of the risk of being trapped in Great Britain if war broke out. Within 2 hours Mercedes had packed their 5 cars and tons of equipment into their 10 lorries. The smaller Auto Union team loaded their cars onto international freight wagons at the railway station at Castle Donington. Both teams were hoping to catch an overnight boat to Holland. They were shortly intercepted by police who had been told to track down the teams and inform them that Major Adolf Huhnlein, head of Germany’s motor sport, had relayed the message that they were to return to Donington. Diplomatic negotiations continued but on Wednesday the two team managers again ordered their teams to leave Donington. Fred Cranmer desperately persisted in trying to salvage his Grand Prix but was unable to contact the Mercedes team manager at Harwich where they were waiting to board a boat for Holland. Harwich was in a state of chaos with German students, businessmen, governesses and tourists all frantic to get home before the outbreak of war. On September 30th, British Prime Minister Neville Chamberlain returned from talks with Germany and proclaimed, “I believe it is peace for our time.” The negotiated Munich Agreement allowed the Germans limited access to the Sudetenland, beginning October 1st, but not a wholesale invasion of Czechoslovakia. Sudetenland was a region of Czechoslovakia that bulged into Germany and was inhabited by 3 million ethnic Germans who would, in theory, welcome unification with Germany. Fred Cranmer quickly requested a change in date for his Grand Prix, to be now run on Saturday, October 22, and the German teams promised to return. Three weeks later, when the race eventually took place, Nuvolari took control at the start and left the cars behind him to fight it out for second place. After an early pit stop to change a problematic plug he then proceeded to battle back from fourth place, over a minute behind the leader. At 46 years of age his skill, bravery, and determination amazed the crowd and they cheered him on, elated at his victory. It would be 55 years before a Grand Prix race would be held again at Donington Park. Hitler’s invasion of Poland on September 1st 1939 officially began World War Two. On September 3rd Neville Chamberlain announced to the British public that “this country is now at war with Germany.” Later on the same day Nuvolari would win the last race of 1939 Grand prix season in Yugoslavia. After the race the Mercedes-Benz manager tried desperately to get his cars and team back to Germany, with rumours that all fuel would be confiscated in Hungary. They did finally reach their factory gates only to have their trucks impounded by the German Army. The glorious German Grand Prix teams were gone, friends were now enemies, and nobody would have been so bold to suggest that Grand Prix racing would even survive the war. Thanks Jennie, that was a good read. I prefer these write-ups more than the “on this day” segments. 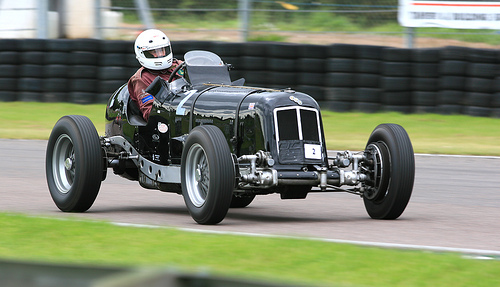 Nice read, and that Auto Union Type-D is just gorgeous! I agree:) It was also amazing that Ferrari was using ideas from Auto Union so many years later! What made you pick this (seemingly) random vignette to tell? The longer answer is because I was reading about Mays who was involved with ERA before the war and BRM after the war and found the historical context interesting. I also loved the Auto Union car with its streamlined wings. The best answer however is what AJ wrote below. He sums up really well the attraction that period of racing has for me and why I wanted to write about it. I found the video mind blowing and the cars going sideways around corners amazing! I have also been fascinated by this period – it was reading Caracciola’s autobiography as a school boy that got me hooked on GP racing. Which I still am today, hence my presence here. And for those moaning about the sound of today’s F1 cars try youtube for the AutoUnion V16 and just listen!! No tone behind my question, just a genuine curiosity! Thanks for the answer. I didn’t know if you were saying “why on earth did you think of writing about that”:) Probably because I have several family members who would have said it like that! This I can totally relate to! Thanks for the heads up earlier that you’d written this piece, too, Jennie. I’m not sure how i missed it earlier this year. As I was reading this, it was very revealing to me how far away we have departed from the emotional directness, simplicity and importance of these early Grand Prix. People were excited for these wild machines, truly beasts, being wrangled by men of true skill, bravery, and determination. Those are key words for me, as two of the three have been rendered almost mute nowadays. The current trouble F1 has with maintaining an interested audience to me is directly related to simple core emotional issues. Human beings react to emotion, and the FIA / FOTA / FOM has been slowly removing it ever since the mid 90’s, watering it down to where we are today. Just my train of though right now. Couldn’t agree more, “watering it down” describes it perfectly.